A scene from "The Animated Life of A.R. 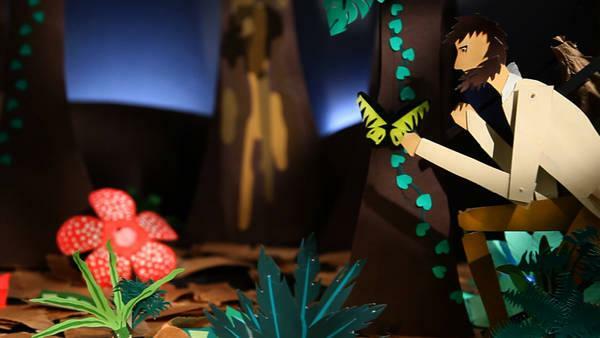 Wallace," an animated short-doc by Flora Licthman and Sharon Shattuck. Visit videowest.kuer.org to see more. You may have never heard of naturalist, biologist and biogeographer Alfred Russell Wallace, but chances are you're familiar with his greatest discovery: the theory of evolution by natural selection. Of course, Charles Darwin receives first billing for the theory of evolution, but Wallace, a contemporary of Darwin's, discovered the theory independent of his better-known colleague. Wallace's life was as grand as his scientific breakthroughs and Tuesday we'll make his acquaintance with the help of Harvard lecturer Andrew Berry. Andrew Berry is an evolutionary biologist and a lecturer in Organismic and Evolutionary Biology at Harvard University. He is the editor of a collection of A.R. Wallace’s writings, Infinite Tropics [Amazon|Indiebound].